The Chinese vessel GAN JIANG with the PLA tug PLACARD in Tilbury Docks. Any info RWJ ? 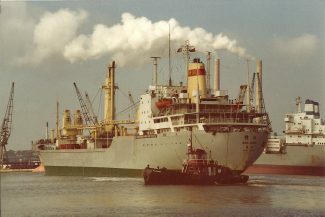 The Chinese general cargo vessel GAN JIANG (11,538 tons gross) was built for a French company in 1970 with the name MARBELLA. It was typical of a large number of ships that China bought in the 1970s and 80s from European owners, including many from the UK. Its Chinese owner, from 1979, was China Ocean Shipping Co of Guangzhou. The vessel was broken up in China in 1999.